Hearts midfielder Paul Hartley faces Old Firm opposition in the race for the Players' Player of the Year award. 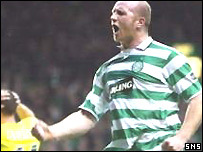 The other nominees are Celtic striker John Hartson and Rangers duo Nacho Novo and Fernando Ricksen. Welsh international Hartson leads the SPL scoring charts this season with 19 goals so far, while Spaniard Novo is just one behind. 28-year-old Hartley has been enjoying a good season and won his first Scotland cap last month. Derek Riordan, Aiden McGeady, Craig Gordon and Mark Wilson will battle it out for the Young Player trophy.